Cup Carnaval Slots | 25 FREE spins & more! 5 reels, 25 paylines, a football theme and a hot Brazilian party – what more could you want?! Spin to win Cup Carnaval Slots today. Play at home or on the go and never miss a win! 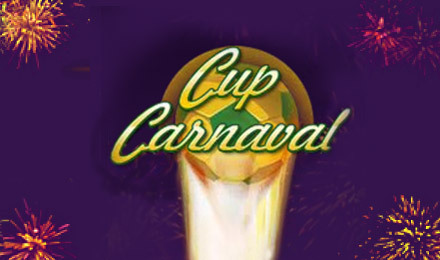 Get ready for a hot Brazilian fiesta when you play Cup Carnaval Slots! You can play at home or on all your mobile devices so the fun never needs to end! This football themed game is sure to keep you entertained and winning big for hours on end. The Wild is the Football symbol, and appears on the 1st, 3rd and 5th reels, and the Scatter is the Dancer. When you spin 3 or more, you'll get up to 25 FREE spins! During this time, the Wild expands, giving you even more chances to win!